Add the apple slices and cinnamon sticks to your pitcher of water. Fill pitcher with water, placing in the fridge for an hour to allow the flavours to infuse. The first time I tried Apple Cinnamon Water I was amazed at how good it was! It was like discovering some secret juice code – a drink that's just as delicious, but without the sugar or unnatural ingredients. No calories, tons of flavor, and apparently it's got some other bonus features as well (does the word DETOX make you all giddy?). I will be the first to admit: I don't really care about all that health fad stuff. I believe in food made from scratch, and eating in moderation. So for me, all the extra bonuses of this water doesn't influence my taste buds. We all know people who have "amazing" recipes that are supposed to be sooooo healthy and taste amazing to them – but in reality, they are like eating dirt. Well, that isn't the case here! Most of us don't drink enough water, that's a fact. It can be pretty difficult to stay hydrated when you are faced with the decision to drink delicious coffee (my weakness), or your favorite soda versus drinking plain old water. This Apple Cinnamon Water helps with that difficult decision! Once you start making this you will definitely be drinking more water, helping to boost your metabolism, hydrating you, making you feel more energized, and creating that wonderful detox effect everybody is looking for these days. I've also found this water really helps if you have a sweet tooth. 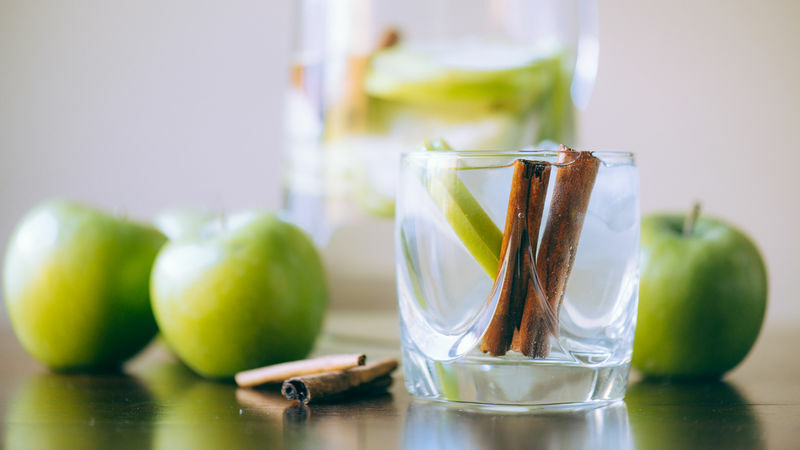 With the cinnamon and apple giving the water a light sweetness, it really helps cut down those cravings! So just grab a pitcher, add in two sliced apples, two cinnamon sticks, fill it with water, let it infuse for an hour and then…get hydrating!